Edinburgh City have made further additions to their squad in the shape of David Verlaque and Moses Olanrewaju. Paisley-native Verlaque, 21, began his career in the youth ranks at Dundee United before moving on to Queen’s Park, Morton and Clydebank respectively. He then made the move from the juniors to Stirling Albion in summer 2015, before joining Berwick Rangers in February. The defender, who can operate at either right back or in the centre of defence, played his last game for the Wee Rangers against his new club in the final game of the 2016/17 season, netting a last-minute winner to give John Coughlin’s side a 3-2 victory and ensure their own safety. Olanrewaju, 20, is a forward who can play on either wing or through the middle. The London-born Nigerian was on the books of both Stevenage and Rushden & Diamonds before moving north to join Stirling Albion in 2014. He spent two-and-a-half years with the Binos before leaving on a free transfer in January this year. 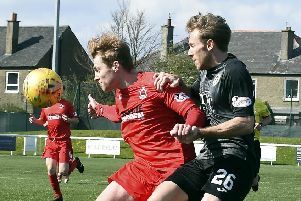 He previously trained with Jardine’s squad last January with a view to penning a short-term deal, but played the remainder of the season with Sauchie Juniors after City opted to sign Serge Makofo. The pair’s previous experience of League Two and their versatility persuaded Jardine to offer both players terms after a successful trial period.